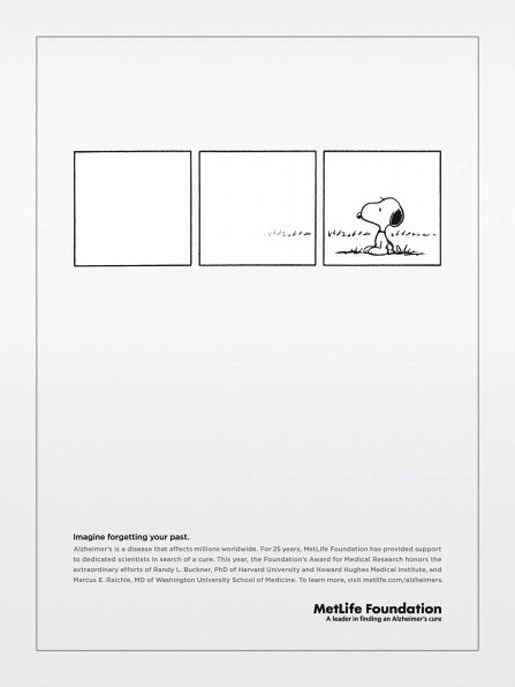 MetLife’s print ad, “Alzheimer’s Print”, has won a Silver award for Financial Products and Services at the International ANDY Awards 2012. Charlie Brown appears on the top of his doghouse, looking back over an empty comic strip. MetLife Foundation’s “Remember Me” project honors memories lost to Alzheimer’s. $1 will be donated to Alzheimer’s research for every memory saved. www.saveamemory.org. The Alzheimer’s Print ad was developed at Crispin Porter & Bogusky by chief creative officer Rob Reilly, executive creative director Ari Merkin, group creative director Gerard Caputo, art directors Tony Kalathara and Liem Nguyen, copywriter Taylor Marsh, print producer Barrie Bamberg, senior art producer Rebecca ONeill, digital artist Jody McClean, DFX Eduardo Santiesteban, content management supervisor Austin Sibley, content supervisor Vivienne Pestana, content manager Josh Mantooth.